Chances are, you have tried any Acer product and you have your own impressions with regards to this company. This impressions came from your experiences about the products – whether you are happy or not. These two are the main answer for each and every query of a reviewer of the said product. Well, here comes another from Acer and it is called Acer Aspire R7-572-6805. You might be thinking about buying or not buying the product, but I suggest that you should know about this first by looking at the features especially the specifications and by reading reviews such as this, you will be accustomed to its features. This laptop is Windows 8.1, 64-bit version with Intel® Core™ i5-4200U processor (1.6GHz/2.6GHz w/ Turbo Boost). It has 8 GB memory DDR3L memory and 1TB hard drive which can accommodate a lot of files that you would like to store in it. With regards to its screen, it measures 15.6" Full HD widescreen with CineCrystal LED-backlit multi-touch display of 1920 x 1080 pixels. It has 4 stereo speakers and Dolby audio enhancement for your listening and viewing satisfaction. With these features, you can enjoy watching your favorite movies and listening to your favorite songs. With regards to its battery life, it can last up to 6.5 hours and it means to say that it has a very good battery life, suitable for carriage. Usually, its color is silver. 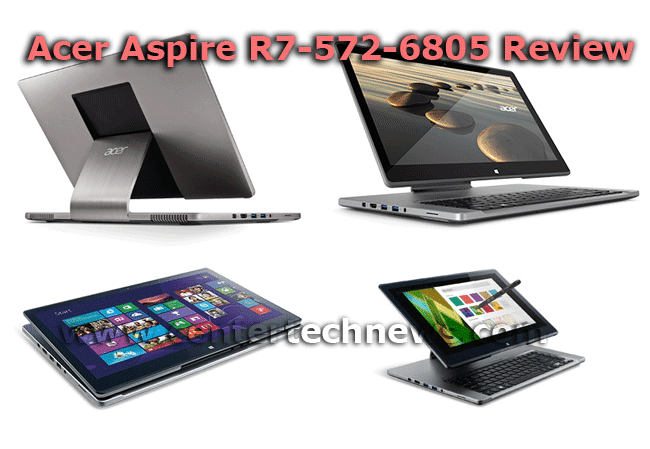 Acer Aspire R7-572-6805 is something that you need to consider from Acer which has been in the industry for so many years distributing gadgets of different kinds. You will surely enjoy a lot of things from this gadget. Use it in your office, school, home and outdoor. It can run applications of heavy type and it can be used for gaming as well. Buying this product will give you 1 year warranty. Suggested retail price is $899.99.